If you're anything like me, novels with magic do something happy and tingly to your insides. It's hard to pinpoint, but I'm going to attempt to flesh out the "Why?" and "How?" behind this magic satisfaction. They say (I've always been fascinated by this phrase, "They say..." I'd like to meet They, and give 'em a piece o' my mind!) that imagination dies with adulthood. For many of us, that's true. Unfortunately, adulthood requires a lot of growing up, mostly because of responsibility. Most of us are so caught up in "the real" that we forget how to use our imagination. But is our imagination really dead, or just hibernating in a deep, dark cave? Perhaps you're one of those people who, like me, pulls out the camera to slyly record your adolescent child playing with his toys. Why? It's cute, no doubt, but again, why? Because for that moment, your child has allowed himself to ignore the world around him. Social protocol, peer/sibling pressure, countless reprimands to grow up or act his age--all of them are gone. Your child has lost himself in his imagination. Unfortunately, that sort of behavior is prohibited for us adults. Can you imagine your boss's reaction if s/he walked into your office and saw you sitting on the ground, legs crossed, feet bare, hosting a puppet show with your business socks? That's why I like having kids so much. They give me an excuse to act like a child in circumstances that would otherwise be considered unacceptable behavior. watched it again as an adult? If you have, you'll agree with me when I say it still rocks! It's one of the very few movies that are still as good as I remember them to be from my childhood. Why? Well, duh! A grownup gets to sword fight, food fight, steal stuff, skateboard, live in a treehouse, kiss mermaids, and fly! FLY! I still dream about flying! (and I don't mean in an airplane) Robin Williams fulfills a hidden part of ourselves that, no matter how deeply it's buried, wants to get out. I say let it! Hold on to your happy thought and spring into the air! Thus enter magic books. For the same reason we grownups love Hook, we also love magic books. They let us do things that we can't do in the real world. And that's why I love writing them! Have you ever wanted to control what happens in your dreams? That's exactly what I get to do! "Inspiring an unwavering passion for reading across the globe, one community at a time." 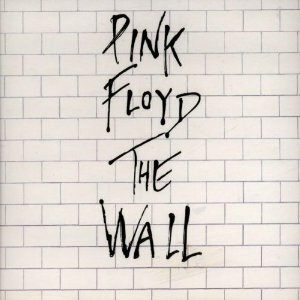 Beyond Pink Floyd's The Wall: What's Out There? It may seem like an unlikely topic for a "book discussion group" but Pink Floyd's The Wall is not only an iconic and powerful concept album (and film), but a rich and deeply moving poetic experience that explores topics that remain relevant to modern listeners some 34 years after its release, including the notion of personal identity, mental stress, the impact of war on families, the impact of the celebrity cult from both the audience and the celebrity point of view and many other themes. Because the wonderful Al Filreis invited me, as a ModPo alumni, to join in, I decided to sign up for Book Group #69 - Beyond Pink Floyd's The Wall: What's Out There? Aside from just being a terrific way to open an album musically, I see “In the Flesh?” as an invitation to the listener. We are, literally, at the show (we’ve turned on the music – ready to dive into the concept) as audience (simple observers), antagonists (feeding off the illness and frenzy for our own enjoyment), and co-protagonist. The album opens at the height of Pink’s illness – the critical climax for him. The question mark reminds us that appearances can’t be trusted – this isn’t a reliable narrator – we’re going to have to go deep into his mind and past to find out who he is and perhaps to an extent, who we are. Moving into “The Thin Ice” we have a stark contrast (the lullaby refrain) that signals we’re now flashing back to the beginnings of the story we opened at the climax of – the very start of the illness – at birth perhaps. The progression is that of a narrative, but as Alec pointed out – one that has a therapeutic arc – we’re digging into the psyche on that journey. We’re now beginning the process of “clawing” through the thin ice of the disguise (hence the repeated use of the word “claw”). Are you a fan of The Wall? If so, just for fun, why not respond below with your own interpretation of the first two songs on the album (you can listen to them by clicking on the song names above). There are lots of other great discussions going on through UPenn's Alumni Association including Scott Momaday's The Way to Rainy Mountain, The Poetry of John Ashbery, Woody Allen's Annie Hall and Bullets Over Broadway, Nabokov, and lots more. The program is only open to UPenn Alumni, but apparently if you do ModPo you're an Alumni! 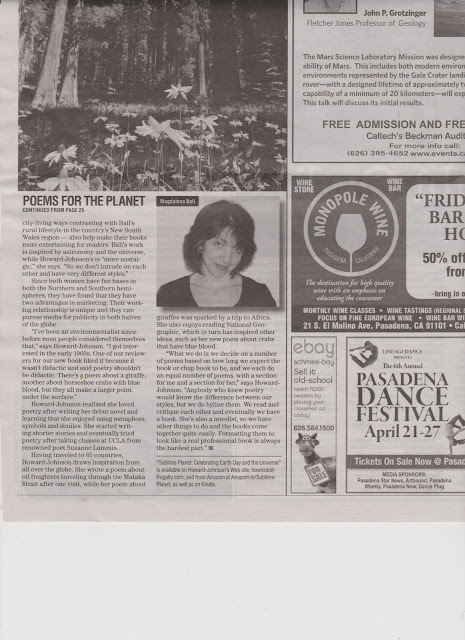 Just another reason of many reasons (like the fact that it's wonderful) to participate in ModPo. The next one begins on the 7th of Sept, 2013. Do you know how to read? Well of course you do or you wouldn't be reading this, but in his latest book How to Read Literature, professor Terry Eagleton argues that we no longer read properly. As someone who spends a lot of time analysing both form and content and reading deeply, I'm afraid I find it hard to agree. Even at the most cursory level, I seem to have conversations nearly every day with people about books, sometimes in a great deal of depth, and often without advanced planning. Yes, I'm a book reviewer and an author, but the people I talk to often aren't. My experience has been that many people, and not just ex-English majors, do indeed read deeply, thoughtfully and enjoy exploring the meanings of what they're reading. This is substantiated by the continual increase in online book bloggers, book discussion groups, and book clubs, both in person and virtually. 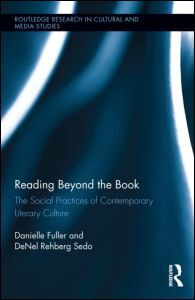 In a ten year study carried out in the UK, Canada and the US, Danielle Fuller and DeNel Rehberg Sedo analyse and chart this growth, looking, in particular, at 'shared readings' in Reading Beyond the Book: The Social Practices of Contemporary Literary Culture. Of course Eagleton argues beautifully in his usual chipper style about the need to read more slowly, more thoughtfully, and to do more analyses of what we read. I agree wholeheartedly with him on that point. Speed reading and cliff notes just don't cut it for a wonderfully crafted novel or poem, and every reader could benefit from slowing down and taking more time over our books, looking with more care at things like sylistics, form, structure and references. Objectivity in criticism is important, but so is subjectivity. We read, above all, with love, giving ourselves up to the story, the characters, and the sheer beauty (and sometimes horror) of their transitions. Talking about books in those terms is no less valuable than talking about tone, texture, syntax or structure. That said, Eagleton's book is great fun in itself, and covers a pretty wide range of literary examples. I just don't think it helps to be too elitist about reading. What is obvious to me and to Fuller and Sedo (even if it isn't always obvious to Eagleton) is that we're not only reading properly (in our own myriad of perfectly valid ways), we're analysing and discussing books to a greater extent than ever before. on the macadam and winter-slagged footpaths. 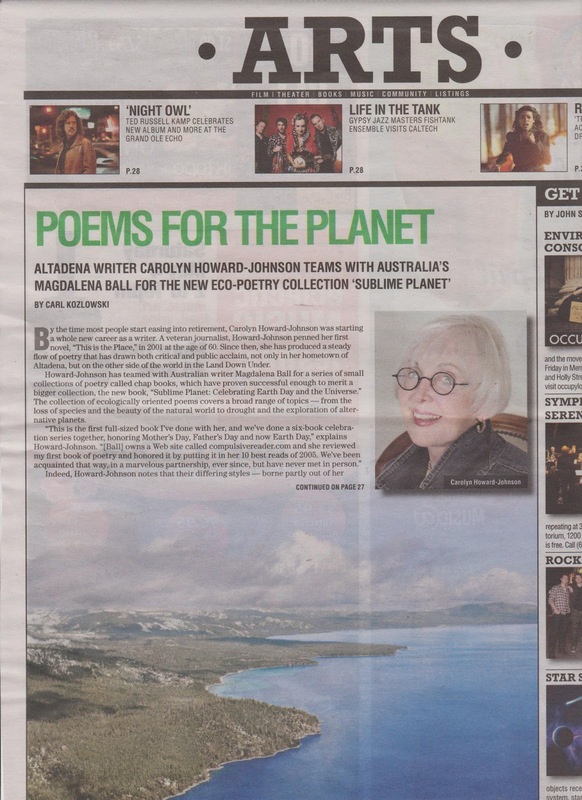 My co-author (and promotion maven) Carolyn Howard-Johnson has secured us the front page of the Pasadena Weekly Arts section. The piece talks about our unlikely (because of the physical distance between us), but highly successful collaborations, our Celebration Series of poetry books, our contrasting styles, how we develop the themes and work together despite the Pacific ocean between us, and our new ecologically oriented, full-length book of poetry Sublime Planet. Of the collaboration, JeRu says: "Magdalena and Carolyn are the ideal combination - two poets whose words beautifully complement each other, whose poems twine around the auditory and 'literary' senses to create a collection as balanced as the pearl in a perfectly graduated string! I think that our continued output probably is a testiment to that. We're currently working on a food oriented collection. Should be a good excuse for some gastronomic research.